A clogged trap in a toilet is a ticklish problem, so be careful with whatever method you use for cleaning the drain. Most toilets are made of vitreous china, which might crack if exposed to extremely hot water. A plunger will normally handle simple toilet clogs. 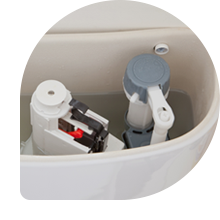 Another method of cleaning a toilet trap or toilet is the use of an auger with an adjustable, crank-type handle. Known to plumbers as a "snake," the spring-steel coil is easily worked past the trap and down the pipe. A three-foot auger is inexpensive and will quickly drill through most clogs. Use the auger carefully. Careless handling may crack the toilet. If the rubber-cupped plunger or the auger does not clear the toilet, call your plumber.